Lowlife Magazine UK - ZineWiki - the history and culture of zines, independent media and the small press. 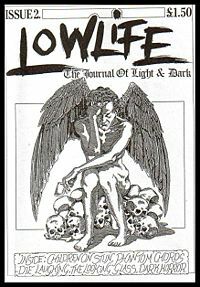 Lowlife Magazine UK was first published in 1993 as Lowlife Magazine - The Journal Of Light & Dark, a London based photocopied A5 fanzine for the gothic rock band Children On Stun. The zine later developed into a glossy covered printed magazine covering 1990's gothic/alternative/industrial/underground subculture and continued for thirteen issues, ceasing publication in printed format in 1997. Each issue typically included interviews with bands/ artists/writers/actors/comedians, dark fiction, reviews of music/gigs/books/videos, photos, news and artwork. Each issue usually ran to around 180 pages, the format was always A5 paperback bound and there was never an index or content list printed with any issue. The magazine was primarily created by John Tucker (artwork/design/layout/interviews/reviews) and Phoenix Hitch (interviews/fiction) and this collaboration was augmented by the photographer Kevin Curtis. John Tucker is an underground artist best known for his artistic partnership with Children On Stun and was responsible for cover artwork on their recorded releases and the bands T-shirt designs etc. He has also created or reworked logos for the bands All Living Fear and Kiss The Blade. Phoenix Hitch was a horror fiction writer who contributed many short stories to underground magazines and publications in the 1990's. She died in 1995. Shortly before her death she had ceased working on Lowlife Magazine and created Afterlife Magazine, of which the first issue was published posthumously. Kevin Curtis is a commercial photographer based in London. Lowlife Magazine has been reactivated as a project by John Tucker on Myspace and appears under the title Lowlife Magazine Vers 15.1. There is also a Myspace Lowlife Magazine Archive page which includes a complete listing of the printed magazine along with content lists.